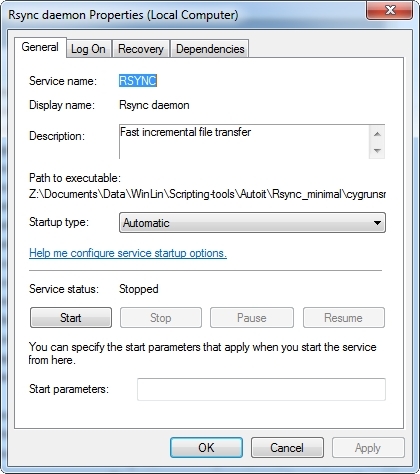 cygrunsrv -I "RSYNC" -d "Rsync daemon" -p rsync.exe -a "--config=rsyncd.conf --daemon --no-detach" -f "Fast incremental file transfer"
cygrunsrv: Error starting a service: QueryServiceStatus: Win32 error 1062: the service has not been started. Does it work on Win 2k8 R2? Check your Windows log and find something like: "sshd: PID : Possible duplicate cygwin1.dll:"